and a pair of old tennis shoes. get any older not knowing how to drive a standard. Up until Thursday evening, my entire experience with a stick shift was a sad attempt at a driving lesson around the neighborhood with my friend Melissa about 4 years ago, a few country roads with my friend Anita about a year ago, and one load of junk from the house to the dumpster with Curtis and Stephen. Poor Big Red. So I pulled up after having been given due permission to drive Big Red for a week. Climbed in and started it up just fine. Then I surveyed my dilemma. The marks have long since worn off the gear selector and I couldn’t remember how to put it in reverse. To make matters worse, the truck was parked right in front of a pole. I only had about four inches of trial and error. Not a great start to this adventure. So, I did the logical thing. I called my dad and asked him how to reverse. He tried to give me instructions to drive a truck he’d never seen before while I tried to talk on the phone and try them out at the same time. Like I said, the truck started just fine. I know because I started it about ten times in a row. Yeah, in a row. I couldn’t get the truck to move. Not forward or backward. It just kept dying. I finally hung up the phone so I could focus. But it wasn’t until I finally figured out the parking break that I actually went anywhere. Well, things went okay as I pulled out of the driveway and onto the country roads, but I had forgotten a very important detail. I was going to have to pull out from a stop sign and make a left into heavy, highway speed traffic. Well, here we go. Well, here we didn’t go. I tried to go. I tried to go several times. But I kept going backwards. I kept hitting the gas and the truck would roll backward. What in the world? I didn’t have it in reverse. I wasn’t on a hill. The people behind me started to back up. I tried a few more times. By now, I wasn’t scared of getting killed pulling out into traffic, I was scared of Big Red reversing his way all the way home. The vehicle behind me pulled up next to me. “Not working?” It was two guys from…another country. They were laughing and it was probably a good thing I couldn’t understand much of what they said. They pushed me and Big Red over onto the side of the road. It’s leaking. They informed me. That must be the problem. It’s leaking. Another guy pulled up in front of me and popped the hood. “That’s your radiator.” He said. “That’s your…” He proceeded to point at all of the different truck guts and tell me their names. Very helpful. Finally he said, it’s not leaking anything. That’s just the air conditioner. Here let me try this. He hopped in and had it working just fine. He threw me a softball, “Sometimes the clutch just needs to be pumped a few times.” Then he gave me his phone number and told me to call him if I had any other problems. Yeah, right. So, it was me and Big Red again. Somehow, we made it all the way back to the office. Forward to the office, I mean. Do you know that Fords kinda jump around? It’s the weirdest thing. I just prayed no one I knew saw me hopping, crawling, dying, and just generally surviving my way into town. When I pulled into the parking lot and shut the thing off, I couldn’t for the life of me get the keys out of the ignition. Finally, I gave up and just left it. Surely no one would steal Big Red. He wouldn’t even let me drive him and I had permission. Then I had a stroke of genius and I hung one of the old tennis shoes over the keys–so no one would notice. Big Red and I got along pretty well that night and the next morning as I was on my way to work I started thinking I was starting to get the hang of driving with a stick shift. I pulled up at the final stop sign across from the office and let out a sign of relief. But it wasn’t over. Big Red threw the biggest fit of his life. As I hopped my way into the parking lot–my pastor drove by. Excellent timing. Just smile and wave. That brings us to Saturday. Saturday I was supposed to go kayaking with a group from church. Jonathan asked if we could take Big Red since it would be easy to hitch up a trailer to him. I said that would be fine as long as he drove it. I didn’t want to put anyone through me driving a stick shift–with a trailer–on unfamiliar roads–with other people following me. That would be a recipe for disaster. Jonathan had no trouble at all taking the keys out of the ignition when he stopped. So not fair. We were parked at a boat landing generally in the middle of nowhere, so we threw all of our valuables inside and locked the door. That was 9:30 am. Little did I know, the ignition key that I so carefully put in my pocket before locking up was just that–an ignition key. It was not going to open the truck. Not ever. Not with any amount of convincing. A coat hanger wasn’t going to do anything for us either. 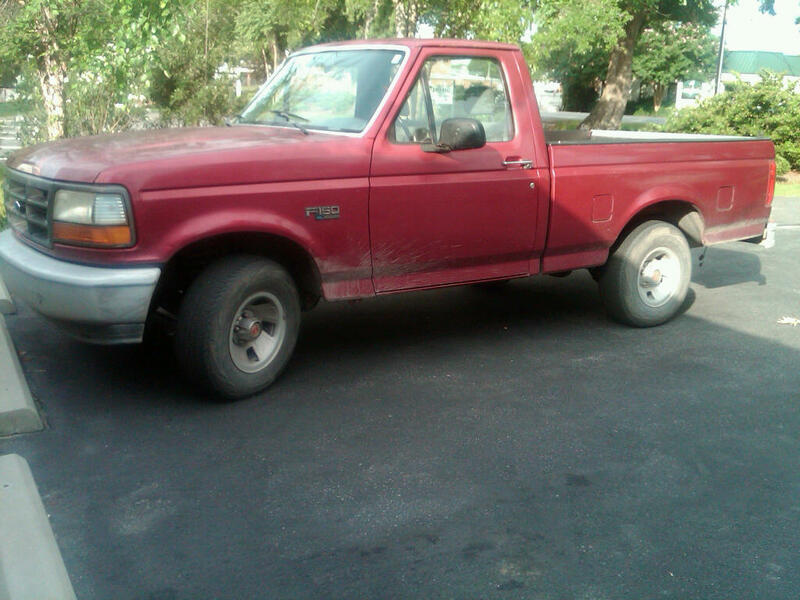 When you lock up a 1994 Ford truck, you’re done. That’s it. It was 4:30 pm before Big Red and I were happily on the way home again. I was tired and he was hungry. But overall, it had been a good day. Sunday morning, I opted not to take Big Red to church. I was going to meet my cousin and his wife whom I hadn’t seen in years. Just for…good measure…I would take my Chevy Silverado. That was probably a good decision. When Nathanial saw my wheels he said something like, “a truck? I didn’t figure you to be such a redneck.” Good thing I didn’t bring Big Red. Nathanial would have bought me a pair of overalls and started calling me Bubba. Well, I’m not discouraged by the fact that I can’t open Big Red, can’t move him, and end up going backwards when I want to go forward. Honestly, that’s not the problem. The problem is that he goes through gas like he owns BP. Big Red has two tanks and we’ve been through both of them. I guess that is his way to get even with me and it might be working. I wish I could tell you how many miles we’ve traveled together, but the odometer is broken. Along with the speedometer. I guess that’s kind of part of what makes him. And now that we’ve mostly worked out our differences, I may just let him return to his comfortable life as a farm truck. I thought about giving him a good scrubbing before I return him, but after all we had put each other through, he had earned my respect. And like any good farm truck, he is probably happier with the mud. Originally posted May 31, 2010.